On a cool day in September last year, about a dozen men wearing identical gym shorts and white T-shirts filed out of a large tan building in East Moline, Illinois. 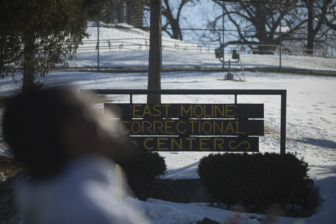 The building, perched on a hill near the Mississippi River and surrounded by barbed wire, is the East Moline Correctional Center. The men were loaded into a van and driven six miles to a bus station. Each was issued a ticket to Chicago. Among them was John Williams, 43, who had just finished a one-year sentence at the minimum security prison, which houses 1,441 male inmates. He had served time for retail theft, his second felony in 20 years. Williams was taking the first steps in his sometimes rocky journey of re-entry, recovery and redemption. He was relieved to be headed to Chicago, but it felt strange. Williams was 20 years old when he was first jailed for an armed violence charge that resulted from a brawl involving the attempted murder of a drug dealer. By then, Williams was a marijuana and crack cocaine dealer himself. Williams grew up the youngest of six children in the South Shore neighborhood. His father died before he was born, and he describes his stepfather as an alcoholic. “He was financially, physically, and emotionally abusive to my mother to the point where my older siblings began to fight him back and I was just a little kid and I was scared.” Without a father figure, Williams felt that he lacked an identity, and began to seek guidance from an older brother who was involved in a gang. “I really did not go out starting trouble, but I was welcoming to finish it,” he said. Williams has long struggled with substance abuse. 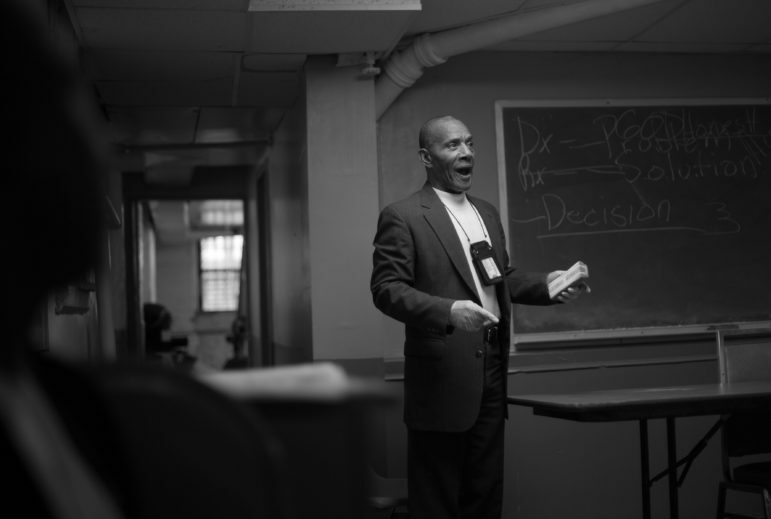 While incarcerated, Williams decided to put his addictions behind him and began attending Alcoholics Anonymous and Narcotics Anonymous meetings. But maintaining his sobriety wasn’t easy. Tragedy had struck five weeks before he left prison when his eldest son, Walter, was shot and killed at 34th Street and Indiana Avenue by two teenagers, now awaiting trial. Williams decided to use his grief, not as an excuse to slip into old, self-destructive patterns, but as a motivator to stay clean and start over. Williams wears a sweat shirt that belonged to his son Walter. It is the only possession of his late son’s that he still has. Chicago has 12 pre-approved “host sites” where inmates are allowed to live after being released on parole. Williams was not able to secure housing at his first choice, a sober living facility he was familiar with, and was instead placed at a homeless shelter. 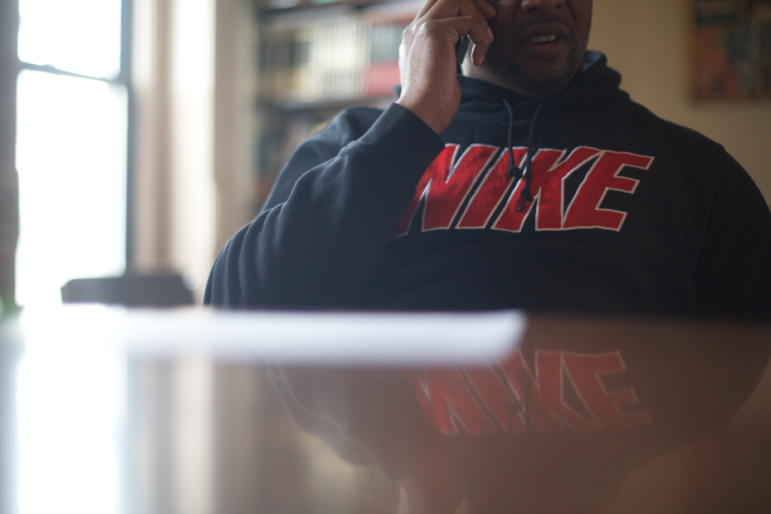 The first night Williams spent at the shelter, he witnessed men using using crack. He was determined, he said, to find a way to get into a different living facility that would be acceptable for his parole conditions. He called St. Leonard’s Ministries. 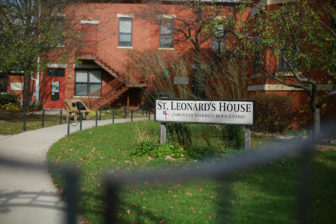 St. Leonard’s provides comprehensive residential, case management and employment services for formerly incarcerated men and women. After an interview, he was accepted into their six-month transition program. At St. Leonard’s, he would get three meals a day, attend classes and receive job training. Residents are assigned chores to help with building upkeep. Drug and alcohol use are not permitted. Church had been part of Williams’ life in good times and bad. 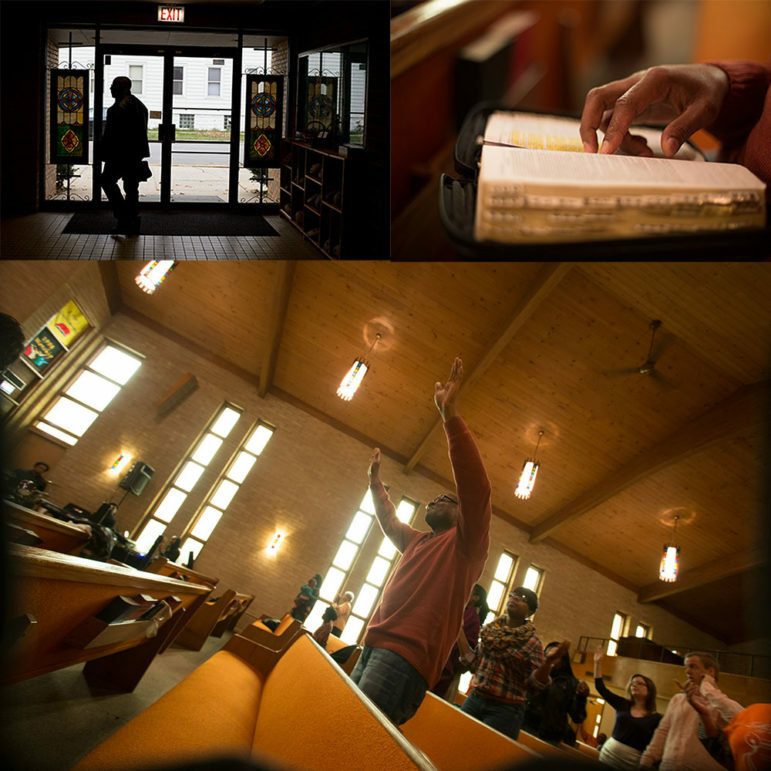 Before he was incarcerated, he attended Shekinah Church in Riverdale. He continues to attend services, although it takes him a lot longer to get there — an hour and a half via public transportation from St. Leonard’s House on the West Side. He tries to keep himself mentally and physically healthy through exercise. He and a friend joined the Back on My Feet program, an aptly named group that meets at 5 a.m.outside St. Leonard’s three times a week. The group runs up to four miles together. Williams learned yoga in prison. After his morning runs with Back on My Feet, he attends a yoga class in the basement of St. Leonard’s. He was temporarily sidelined from exercising after he fractured his foot. 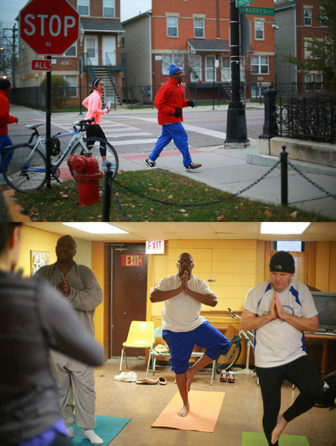 The program at St. Leonard’s also includes classes to help participants adjust to life outside of prison. A class on parenting instructs residents on how to rebuild relationships interrupted during incarceration, and on coping with the stress of being a parent. Douglas McKinney, who was formerly incarcerated himself, speaks to residents about how everyday annoyances can trigger impatience and anger and how to manage those feelings to stay sober. Douglas McKinney speaks to St. Leonard’s program participants on the importance of staying sober. Williams also has completed Employment Preparation Training, a four-week program that teaches skills to better chances of finding employment. Through EPT, he was paired with a coach to help him in his job search. Williams said he has applied to hundreds of jobs unsuccessfully. He said, “It is a difficult feeling when you are in an interview and everything is going well, but you know the question is coming: ‘Have you ever been convicted of a felony?’” While he pursues full-time work, Williams has been repairing appliances through his business, Walter’s Appliance Repair, named after his late son. 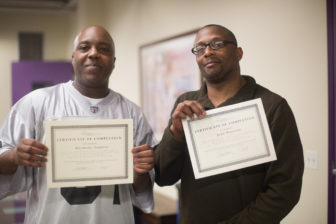 Williams and his friend Ali hold up their Employment Preparation Training (EPT) certificates. 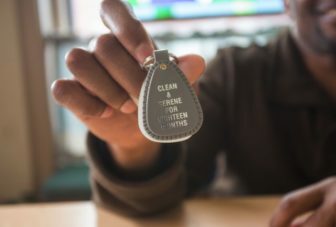 After completing the six-month program at St. Leonard’s in April, Williams applied for and was placed on a waiting list for permanent subsidized housing offered through the organization for men exiting prison. He also is seeking housing through the Chicago Housing Authority. In the meantime, he lives in a dorm-like room at St. Leonard’s house. Despite the challenges he faces, Williams remains optimistic about his prospects for the future. During class one day, he said he used to feel like he needed to have a “mean mug” look on his face most of the time. 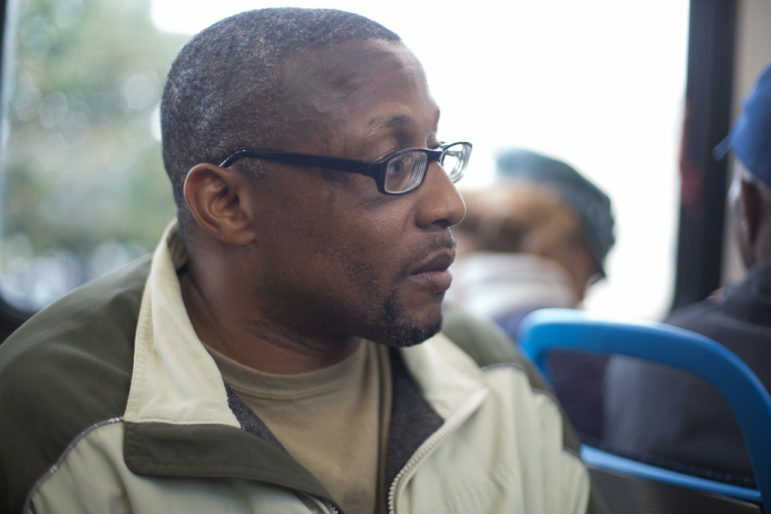 But since participating in the re-entry program, he has learned to smile and be himself.